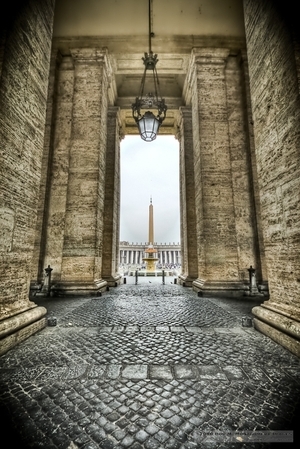 Piazza San Pietro, or Saint Peter's Square, in Rome is a fascinating place. One of the single most visited places in history, it's undoubtedly one of the most photographed as well. It's nearly impossible to get a shot that doesn't have throngs of visitors (unless you're working for the Vatican, of course, and then it's just a matter of making it happen), but I felt lucky to have found an angle of my own. That Egyptian Obelisk in the center is massive, and the scale is thrown way off by the angle ... it's 25.5 meters tall! The smoothness of the cobblestones betrays the shear number of feet that have trod those simple stones; they are nearly glass smooth to the touch. It's a place that must be visited to be understood, and in all likelihood, it's a place that demands multiple visits if one is to truly understand its impact on the world.